If you want to maintain your healthy eating plan at Chili's you may have a little work to do. While the casual restaurant does provide a few healthy menu items to help calorie counters stick to their budgets, most of the food at this joint is fairly high in fat and calories. It's best to check Chili's nutrition information before you go to keep your diet on track when you dine there. One thing that is helpful to know when you go to Chili's is that most of the non-alcoholic beverages are "bottomless." That means your drink will be refilled continuously unless you ask your server to stop. If you're drinking a beverage with calories, then you'll be consuming calories continuously as well. A strawberry lemonade, for example, provides 190 calories. But if you have three lemonades during your lunch or dinner, you've consumed nearly 570 calories—a hearty meal's worth of calories. Another consideration to keep in mind at Chili's is that many of the entrees are large which drives the calorie and fat content up. However, if you choose the entree that you enjoy and split it with a friend, you'll be able to satisfy your craving for Chili's food without derailing your diet. Lastly, it's always smart to check the menu online before you go. If you have time to check the full Chili's nutrition facts, it's easier to make a smart decision about what to eat to keep your eating plan on track. The printed menu in the restaurant is quite extensive, so it can be hard to quickly select a diet-friendly dish when your fellow diners are waiting. Many of the soups and salads on the Chili's menu are quite popular. While most of the soups are relatively low in calories, they may not be satisfying on their own. A cup of the Chicken Enchilada Soup, for example, only provides 220 calories. But if you pair it with a Santa Fe Chicken Salad you need to add another 670 calories and 47 grams of fat to your meal total. And if you add dressing to your salad, plan to add another 100-300 calories. Fajitas are another popular item on the Chili's menu. But calculating calories for this mix and match dish can be somewhat tricky. For example, let's say you wanted to enjoy classic chicken fajitas. You'd order the Fajita Peppers & Onions for 300 calories and 23 grams of fat. Then you'd add one portion of Grilled Chicken for 110 calories and three grams of fat. But you still need tortillas. Three flour tortillas will increase your calorie count by 260 calories and 9 grams of fat. So far you've accumulated 670 calories and 35 grams of fat. Add fajita toppings (for another 370 calories 31 grams of fat) and your grand total is 1040 calories and 66 grams of fat. Are you a fan of ribs? At Chili's a Half Rack of Original BBQ Ribs provides 470 calories and 28 grams of fat. If you make it a combo and add a 10-ounce Classic Sirloin you'll increase your meal total by 390 calories and 19 grams of fat. Mango-Chile Tilapia for 520 calories, 19 grams of fat, 4 grams of saturated fat, 55 grams of carbohydrate, 38 grams of protein and 1580 milligrams of sodium. Many of the salads on the Chili's menu are fairly high in fat and calories. Why? Because they include fried or fatty ingredients that boost the calorie count. The Fresco Salad, however, and the House Salad are both under 200 calories without dressing. 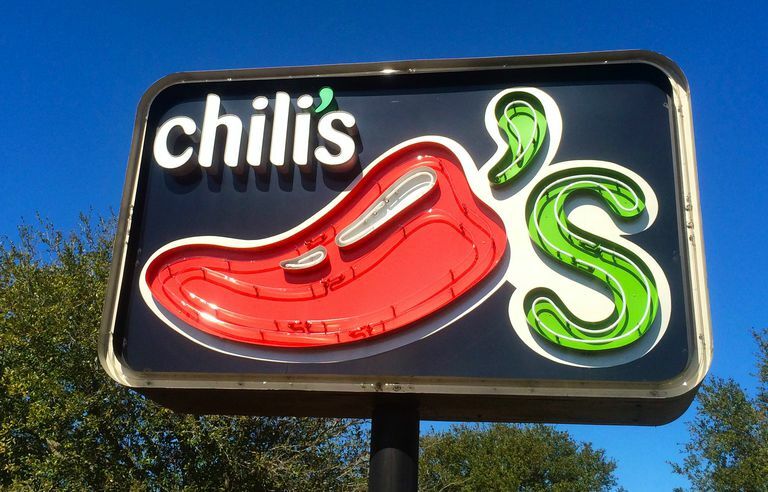 It isn't hard to find excessively high-fat and high-calorie items on the Chili's menu. This isn't a restaurant that you would necessarily choose to visit if you are trying to limit your calories. But what are the worst items that you can eat? Some of the burgers and burritos will set you back over 1000 calories. The Big Mouth Bites Burger provides 1220 calories, 71 grams of fat, 25 grams of saturated fat, 91 grams of carbohydrate, 60 grams of protein and 2820 milligrams of sodium. The Southern Smokehouse with Beef Burger provides 1140 calories, 70 grams of fat, 25 grams of saturated fat, 77 grams of carbohydrate, 56 grams of protein and 2860 milligrams of sodium. The Smothered Carnitas Burrito with Rice provides 1110 calories, 53 grams of fat, 25 grams of saturated fat, 95 grams of carbohydrate, 63 grams of protein and 3310 milligrams of sodium. One of the worst items on the menu is a salad. The Quesadilla Explosion Salad provides 1480 calories, 100 grams of fat and 30 grams of saturated fat. You'll also consume 2480 milligrams of sodium with this meal. And not surprisingly, desserts will derail your diet for days at this restaurant. Most items provide 700 calories to over 1000 calories with the highest fat dessert being the Skillet Toffee Fudge Brownie which provides 1260 calories and 60 grams of fat.